Libya’s National National Commission for Human Rights says that it holds the Presidency Council and its government of national accord responsible for the suffering and tragedy of the people of Tawergha, now in their seventh year living in squalid conditions in camps as refugees. 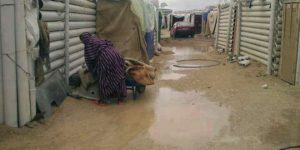 This has to end, it has said, expressing its deep concern at the flooding and cold currently faced by those in camps in Tripoli as a result of the torrential rain and cold. There has to be urgent humanitarian assistance for them, it has said. Yesterday, Tawerghans, mainly from the Falah camp near Tripoli’s Airport Road, protested outside the prime minister’s office demanding to be allowed to return to their hometown but also to be given adequate shelter. Once again, as happens every year, the camp has been flooded. Social media reports that five Tawerghans have drowned in the camps at Falah and Janzour as a result of the flooding have not been confirmed.